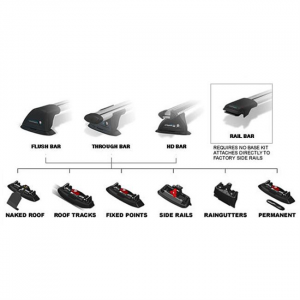 Aerodynamic and whisper quiet, the compact Whispbar Flush Bars are a virtually silent roof rack system. The Whispbar Heavy Duty XBars earn their keep. Highly adaptable for work and play, this heavy-duty system not only carries your boats and snowboards, it hauls lumber and ladders with ease. Designed specifically for vehicles with raised factory siderails, this pair of aerodynamic and whisper-quiet Whispbar Rail Bars are a virtually silent roof rack system. This Whispbar Fitting Kit anchors your Whispbar rack system to your vehicle for a sleek, integrated fit. Carrying wide loads, the extended Whispbar Through Roof Bars are a virtually silent roof rack system.